I might’ve believed it, but he posted a picture of the said art, which shows nothing of the sort. The girls just do not want their skirts wet. Does he even know what “sexualized” mean? Protip: their skirts wouldn’t even reach the water if they weren’t hiking them at all. There are two questions to consider here: 1) is the artwork sexualized, and 2) is the artwork intended to be sexualized. If the latter, does this mean RightStuf! is lying about a product to sell the product? I’ll begin with the last question, regarding RightStuf! using this artwork to sell the product. 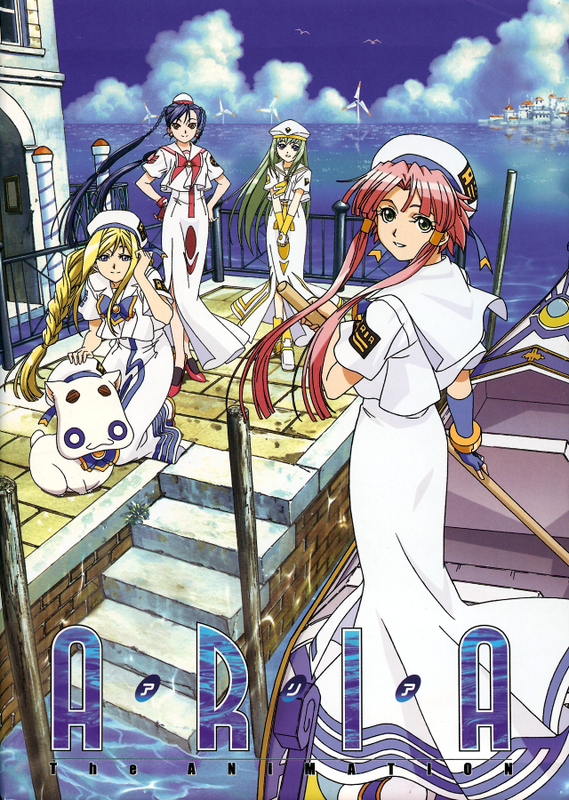 Looking at Aria for sale on RightStuf’s web site, the image shown is the front cover, not the back cover in question. Additionally, the package I received in the mail came with a card advertising the manga this series originated from on its reverse side, and advertising Aria on the visible side. The card covers the back box image. In other words, the artwork in question is not visible until one has purchased and opened the product. In stores, I imagine the product will also be shrinkwrapped, but I don’t don’t know if the advertisement card will be included. Considering the visible side of the card advertises the series (the box doesn’t have a series description probably not to interrupt the artwork), my guess is that the back artwork will not be visible when looking at the box set on store shelves (but I could be wrong). I don’t know how many artworks have been released showing Akari and her fellow water nymphs. I gather this image was used for two reasons: 1) it shows the main characters, not just Akari, and it shows the main characters at leisure. 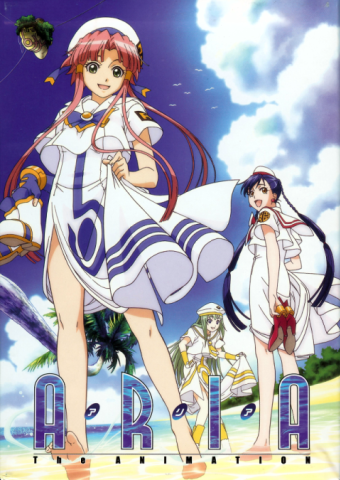 For a series such as Aria, is leisure not a suitable image to portray? That leaves the first question: is the artwork itself sexualizing the characters. It’s already been established that the girls hold their dresses up to avoid getting them wet in water that goes an inch over their ankles. The water in the box’s artwork isn’t as high as in the above screenshots, but walking around in the water is visibly splashing the water about, and there’s no telling how high the tide is each time it rolls in during the depicted scene. Next is the angle. The front cover, below, shows the girls being looked down upon slightly. The back cover (up above) shows the girls being looked up up slightly. This allows gives a complete view of a location up in the sky, as well as the sky, clouds, and sea gulls. The emphasis in the background is on the wide, blue sky. An artwork of Akari holding President Aria, and Aika beside her. They are standing before railing, and the camera is directly in front of them. An artwork of an Undine in a while and yellow outfit. The camera is directly in front of her. An artwork of Aika holding President Himeya. The camera is directly in front of them. An artwork of Aika and Akari on a bridge, with Alicia and President Aria in a boat below. The camera here is up high, looking down at an angle at the girls. An artwork of Alicia holding President Aria, a green-haired Undine near her, Akari up front, and Aika close by. The camera is at a low angle, and tilted to the side, looking up at the girls from below. An artwork of a snowy scene, with Aika holding President Aria, the green-haired Undine in the back, and Akari catching the snow in her palm. The camera is again at a low angle, looking up at the girls while at a tilt. The way I see it, there are just enough artworks from the lower angle to justify its use without it sexualizing Akari or the series. Rather, I think it puts a minor emphasis on Akari’s right foot, the water splashing as she steps, adding to the feel of “walking barefoot through the shallow beach tide”. If you want to see what I’d call sexualizing, check out the cover for the region one box set of Princess Tutu. Even if it is official artwork, there’s no reason to use Rue dressed in such a way to sell a series where she’s only a secondary main character. Especially since that in no way represents the series at all. The water in the scenes is different; it simply IS too shallow to warrant the hiking on the cover. BUT that fact aside, um, okay, reading way too far into my post. The topic of sexualizing Aria came up when we tried recording our ill-fated podcast (more on that here and here), and when I got my box I was like “lol legs I’ll post about this!” Just because Aria brings the serious out in me does not mean that every Aria post of mine is serious. Actually, I wondered whether your post was serious or not, and initially I decided not to bother writing anything. When Author referenced your post in second of his, I was inspired to write. I just wanted to clarify, for various reasons. Cheers, and keep enjoying aria!